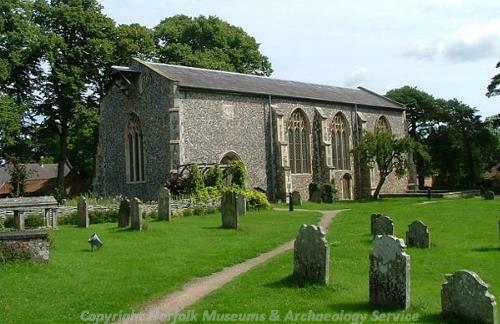 The parish of South Walsham is situated in the Broadland district of Norfolk. It lies east of Woodbastwick, north of Burlingham, west of Upton with Fishley and south of Horning. The name Walsham may derive from the Old English phrase meaning ‘Wæl’s homestead’. The parish has a long history and was certainly well established by the time of the Norman Conquest with its population, land ownership and productive resources detailed in the Domesday Book of 1086. This document states that after 1066 the King held most of South Walsham, although St Benet of Holme also owned some land here. Numerous resources were also mentioned including woodland, a large number of sheep and half of a salt-house (meaning South Walsham shared this resource with another parish). The earliest sites in the parish probably date to the Neolithic period. Aerial photographs show a number of field boundaries and field systems (NHER 49426) that could be of this time, along with several enclosures of an unspecified prehistoric date (NHER 18127). A couple of Late Neolithic/Early Bronze Age flint arrowheads (NHER 8504 and 31276) have also been recovered, but the rest of the prehistoric finds consist of flint flakes (NHER 39977) and scrapers (NHER 31276) of an uncertain date. The Bronze Age seems to have been the busiest period in South Walsham during pre-Roman times. Three ring ditches (NHER 11714, 11715 and 18902) and a series of enclosures (NHER 49445) have been identified from aerial photographs. However, the most significant site is a possible settlement that existed from the Bronze Age to the Roman period (NHER 49428). This possible settlement lies to the south of Chameryhall Lane. No definite evidence of domestic structures was identified, however the plan and demarcation of space indicated by the boundary ditches would suggest areas of domestic use, as well as agricultural fields and paddocks. Another domestic enclosure (NHER 18330) has been identified in the parish, although this one dates to the subsequent Iron Age period. This site lies south of Panxworth Carrs. It seems likely that the site was a small domestic enclosure or farmstead, and small finds of Iron Age date support this interpretation. Other possible Iron Age field systems and field boundaries have been identified elsewhere within the parish (NHER 49427). Few artefacts have been found away from these sites, although a single Iron Age coin was found amongst a collection of medieval debris (NHER 8514). The Roman period saw a continuation in the level of activity established in the Bronze Age. The remnants of a Roman building (NHER 8506) were identified in the Mill Hill Gardens area of the village. The presence here of numerous pottery sherds and animal bones strongly suggests the presence of a domestic building. In addition to this building, many of the potential prehistoric field boundaries (e.g. NHER 18127 and 49445) that are visible on aerial photographs could be of Roman date. This is because it is often difficult to assign a definite date to such vague cropmarks. Metal detecting across the parish has helped to recover a diverse range of Roman metalwork items and pottery sherds. As one would expect a large number of these finds were coins (e.g. NHER 8505 and 40414) but in addition to these a seal box lid (NHER 11859), Dolphin brooch (NHER 29489), Hod Hill brooch (NHER 35328) and key (NHER 39925) have been recovered. The only Saxon site in the parish has been tentatively identified at Manor Farm on School Road (NHER 39600). The presence of ditches, post holes and pottery sherds may relate to the presence of several Early Saxon grubenhauser. Some of the most beautiful artefacts to have been found in South Walsham date to the Saxon era. Foremost amongst these is a superb Late Saxon hooked mount in the Ringerike style (NHER 29489). A box mount (NHER 29691) in the same style has also been found and is of a similar high level of craftsmanship. Other interesting finds comprise an iron spearhead dredged from the River Bure (NHER 8442) and a Late Saxon stylus (NHER 39277). It is also worth mentioning in this section that a 6th century Continental coin (NHER 40245) has been retrieved from South Walsham, but the poor quality of the coin means its exact origins remain a mystery. Both churches in South Walsham date to the medieval period. 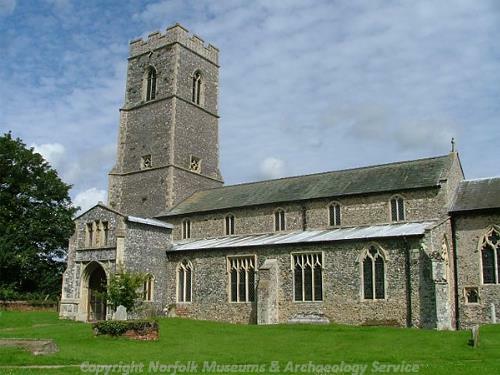 St Mary’s (NHER 8518) is the earlier foundation with parts dating to the 12th/13th centuries. However, the majority of the architecture dates to around 1290-1350 when the nave and aisles were heightened and the chancel was rebuilt. Inside, the church contains a fine rood screen, several medieval coffin lids and a 14th century octagonal font. The original St Laurence’s Church (NHER 8517) dated to around 1500 but was mostly destroyed in a fire of 1827. It was repaired in 1832 but had fallen into disuse by 1946, and the tower collapsed in 1971. Investigation of the church site found evidence of Late Saxon or medieval ironworking. The medieval hall does not survive into modernity although its probable site has been located to the northeast of Manor Farm. Here, tracks and linear features (NHER 11859) tally with a Hall that was marked at the location on 16th/17th century maps. The fact that 17th century Chamery Hall (NHER 14469) is largely built from medieval stone could suggest the present building was built around a medieval building. This medieval stone was probably surplus from the construction of St Benet’s Abbey in nearby Horning. In addition to traditional agricultural practices, peat was cut from Upton Broad (NHER 13515) and South Walsham and Sotshole Broads (NHER 13516) during medieval times. The woodland at Fairhaven Gardens (NHER 35370) also dates to this time and would have been a valuable resource, providing timber, charcoal as well as pannage for pigs. Metal detecting has recovered a variety of medieval metal objects from across the parish. These finds represent a diverse range of activities such as agriculture, manufacturing, trade and religious worship. Finds of note include part of a censer (NHER 11859), an ornate seal matrix with a bird motif and French inscription (NHER 29489), a spindle whorl (NHER 39975) and items of horse apparel (NHER 13096 and 39975). During the post medieval period there were two mills in operation. One existed to the west of Mill House (NHER 15621) and was recorded on an 18th century map. It has been identified as a postmill that was last used in 1866. Another mill, called the ‘King’s Mill’, was shown on 18th and 19th century maps (NHER 8514). This mill was located east of Kingsmills Cottage on Flowerdew Lane, and was fully functional until it was dismantled in 1878. The produce from these mills would have supplemented the more traditional income from agriculture. A post medieval drainage pump has also been discovered in South Walsham (NHER 8461). The steam driven pump had Smithdale engines dating to 1867 but the pump ceased operation in 1937 and was stripped of machinery some time after this point. A couple of post-medieval buildings in South Walsham have been listed as properties of architectural interest. These include Manor Farm House (NHER 45943) and barns (NHER 46022) on School Lane and South Walsham Hall (NHER 13283). The Hall dates to the 16th century and later. The exterior is all Victorian Jacobethan, with spindly chimneys, stepped gables and finials. It is no longer a residential property and now operates as a country club. The site of a second post medieval hall has been identified in the parish. A set of unusual cropmarks exists to the north and east of Manor Farm. These take the form of rectangular enclosures with associated short tracks and various linear features (NHER 11859). It is possible these features relate to a hall marked at this location on 16th/17th century maps and excavations here in 1999 recorded a ditch backfilled with medieval/post medieval building materials. Lastly, it is worth briefly mentioning a selection of the post medieval artefacts that have been recovered. Amongst the more mundane items, such as coin weights (NHER 29489 and 40468) and buckles (NHER 40413), are a number of more interesting finds. Two Venetian soldino coins (NHER 36589) have been recovered, and these were felt to comprise part of a coin hoard. Metal detecting also discovered an intriguing phallic-shaped belt mount (NHER 39274) and part of a sword belt fitting (NHER 36546). No finds or features dating to World War One, World War Two or the modern period have been identified in South Walsham. As such, the discussion of post-medieval finds concludes this summary. Thomas Sunley (NLA) 4 June 2007.